A campaign staffer for Mike Siegel, the Democrat challenging Republican U.S. Rep. Michael McCaul, was arrested Wednesday while delivering a letter to the Waller County Courthouse, the Waller County Sheriff’s Department confirmed Thursday. According to a news release from the Siegel campaign Wednesday night, Jacob Aronowitz, a field director with the campaign, was at the courthouse to deliver a letter disputing a county decision the campaign said risks disenfranchising students at nearby Prairie View A&M University, a historically black institution. The university does not have individual mailboxes for students, and in the past, university administrators and local officials have agreed that students should use a common campus address, either 100 or 700 University Drive, when registering to vote — but those addresses are in different precincts, the Houston Chronicle reported. The 700 University Drive address puts the students in a different precinct than the campus, and Waller County Elections Administrator Christy Eason said Tuesday — the last day to register to vote — that students who had registered under that address would need to fill out change-of-address forms before the election. Aronowitz was at the county courthouse Wednesday to deliver a letter disputing Eason's announcement. According to a Siegel campaign spokesperson, Aronowitz took a photo of the letter's delivery that included the clerk in order to prove that the office had received the letter. In an interview with The Texas Tribune, Waller County Sheriff Captain Manny Zamora said the clerk was "disturbed" and called courthouse security. "He had been told to leave. He agitated and perhaps accosted the female that was there working ... and that’s what we were responding to," Zamora said. He said Aronowitz was arrested and charged with failure to identify, a Class C misdemeanor. Under the Texas Penal Code, a person can be charged with failure to identify if he “intentionally refuses to give his name, residence address, or date of birth to a peace officer who has lawfully arrested the person and requested the information.” The penalty is a fine of up to $500. But the Siegel campaign and Aronowitz’s lawyer, Sylvia Cedillo, said he did identify himself. Siegel told the Tribune he was on the phone with Aronowitz for much of the altercation and that Aronowitz identified himself twice: once to the clerk when he first walked up to the counter and again while Siegel was on the phone with Aronowitz while he was being detained. Aronowitz was detained, arrested and interviewed by the sheriff’s department, Zamora said. Cedillo said she was told initially that Aronowitz was being held on a “48-hour investigative hold” but that he was released two hours later. Cedillo said Aronowitz's court date is Nov. 8. Aronowitz declined to be interviewed. Siegel said he overheard a police officer ask Aronowitz what party his campaign was affiliated with. He called the encounter "an abuse of power." Zamora said party affiliation didn’t play a role in the arrest. 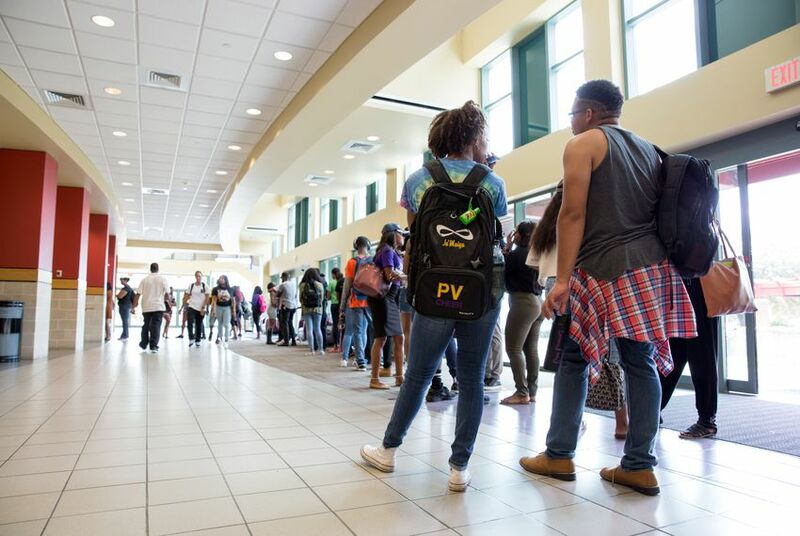 Waller County and Prairie View A&M students have historically been at odds over voting rights. In 1979, a voting rights case involving Prairie View A&M went to the U.S. Supreme Court, which upheld students' rights to register to vote at their college address after county officials claimed the students weren't residents. In 2004, despite the Supreme Court ruling, Waller County district attorney Oliver Kitzman declared Prairie View A&M students ineligible to vote because they didn’t meet state residency requirements — though he later backed down. The campus did not get a polling place until 2013.